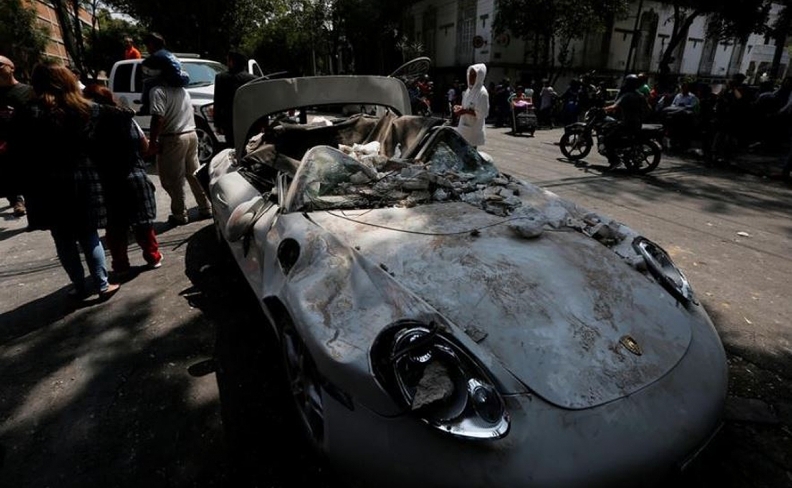 This Porsche was destroyed by falling rubble in Mexico City on Tuesday. Automakers were surveying plants in central Mexico for earthquake damage on Wednesday, with Volkswagen and Audi in the hard-hit state of Puebla halting production temporarily to inspect buildings and allow workers to check on family. The magnitude 7.1 earthquake that struck near Mexico City on Tuesday afternoon caused dozens of buildings to crumble in the capital and surrounding states, with the death toll passing 225 by Wednesday afternoon. Nissan, the largest automaker in Mexico, said there were no deaths or injuries at its Mexico City headquarters or its assembly plant nearby in Cuernavaca, a city in the state of Morelos. Workers were sent home from those operations on Tuesday, the company said in a statement. "We will assess those facilities for damage before determining when they can return to safe operation. We expect to have more to share in the coming days," it said. VW's sprawling plant in the capital of Puebla state -- also named Puebla -- halted production after the quake so that the plant could be inspected, but only minor damage was found, the company said. The plant was restarted for the Tuesday late shift, and administrative personnel returned Wednesday. The plant, VW's largest outside of Germany, builds the VW Beetle, Golf, Golf wagon, and Jetta cars along with the Tiguan compact crossover. VW invested $1 billion into the operations to build the redesigned Tiguan. Audi's crossover plant down the highway in San Jose Chiapa, Puebla, sustained no damage and workers were unhurt, but the second shift was ended early on Tuesday and the third shift was canceled so employees could check on loved ones, the company said in a statement. The $1.3 billion plant opened almost exactly one year ago and produces the Audi Q5 crossover. Ford said that there was no damage or lost production at its factory in Cuautitlan, just outside of the nation’s capital. Most of Mexico's auto plants are either in northern Mexico or in northwest central Mexico where the earthquake was not deeply felt. “We are continuing to monitor the situation, including assessments of potential impacts to dealerships,” GM said in an emailed statement. GM operates an engine and casting complex and engineering center in Toluca. Fiat Chrysler said on its Mexico webpage that it had conducted an exhaustive review of the structural integrity of its assembly operations in Toluca and its headquarters in Mexico City and found all of its facilities in adequate shape to continue normal operations. It also announced on its verified Twitter account (@FCAMexico) that it was sending food, toiletries and other supplies to aid victims of the earthquake. Toyota said its Mexico City headquarters was functioning normally and all of its employees were safe. Its lone Mexico plant, in Baja California near the San Diego border, is far from the quake zone and unaffected. Infrastructure to transport finished vehicles and auto parts from Mexico to the U.S. and Canada appeared to be mostly unaffected. Ports were generally too far from the quake's epicenter to be deeply felt. Kansas City Southern railroad said its infrastructure in the earthquake zone was not damaged and is operating as usual. It did impose speed restrictions on two main bridges on its Juarez and Morelos rail lines due to possible risk of movements due to aftershocks.